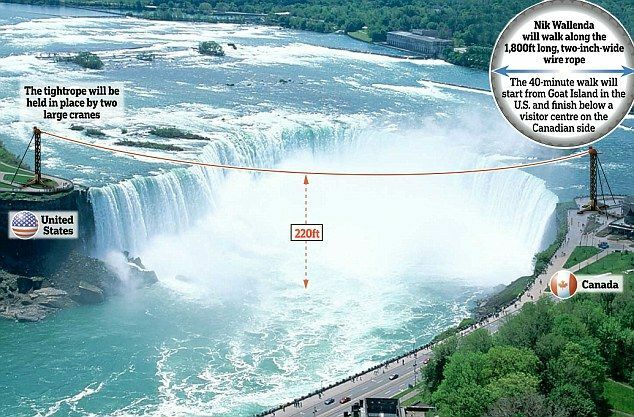 Mail Online reports that Nik Wallenda steps out on a 2 in-thick steel cable to make a 1,800ft journey from the U.S. into Canada right over the gushing fall waters of the Niagara Falls Friday, 15th June. Wallenda will spend 40 minutes being buffeted by strong winds, blinding spray and, if he’s really unlucky, attacks from the peregrine falcons who nest nearby. It may be added that the first to cross the gorge: French acrobat and tightrope walker Charles Blondin was the first ever person to cross a section of Niagara Falls on a 1,000 foot long tightrope in 1859, but chose a calmer spot downstream. So look out for the news on Friday and see history in making.